WOW! Women On Writing Blog: Writing Job Listing: Is It Legitimate or a Scam? Writing Job Listing: Is It Legitimate or a Scam? WANTED: Savvy, hip writer with a unique voice and style to write three articles per week for a rapidly growing publication. Submit three (3) clips, pass our grueling editing test, jump through the fiery hoops of the publishing world and hope you don't crash and burn. Still interested? Mail query and clips to editor @ scammingyou dot com. We'll get back to you if you meet our criteria. If you've ever used an online job board to seek out new opportunities, you've undoubtedly read a few ads like the one above that have you scratching your head, wondering if you should take a chance and apply or run away quickly and never look back. 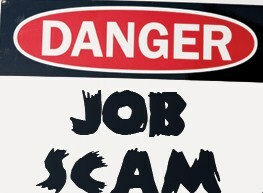 How can a writer tell if a writing job listing is legitimate or a scam? "Test Article." If you're writing a test article, you've just written an article. FOR FREE. Legitimate sources will ask to see published clips. What if you don't have published clips? That's the age-old conundrum. Before dedicating time to research and writing, check out the potential employer and determine if the job listing is worth your time. Also be on the lookout for ads that ask for an overabundance of sample writing. Many ads will ask for a short sample, but if what they're asking for seems ridiculous, be wary. "WriterS Wanted." Notice the 's' on the end of "writer." It's plural. Now, that may not always denote a scam, but more than likely, it's an indicator of a low-paying gig. "Write on Spec." This is the same principal as writing for free. What if they don't like your work? Once again, you're out of time and effort you could have put into another article. "Send $$." If you're asked to pay any type of upfront fee, the listing may be a scam. You shouldn't have to pay to apply for a job. Any exceptions to this rule? Yes. Job bidding sites, like eLance, where you pay to join, but that's a different monster than paying to have an editor reading your work before considering you for a writing job. "What's Left Unsaid..." If a listing doesn't ask to see a clip, it may be a scam. Editors of legitimate publications and websites will want to see what a writer is capable of before hiring her. After all, they are looking out for their publication. So, you've double-checked the job post that piques your interest against this list. You're still not positive whether or not it's legit. A few common-sense tips can help you decide. Check out the company. Does the publication have an online presence? What about an email address? Does it include a dot com (or biz or net) addy? If a person's name is included in the listing, an easy Google search can help. Same with a phone number, if included. If you can find an online trail, that doesn't include any red flags, you may have found a legitimate posting. Ask for a contract. If you've submitted sample work and the editor has been discussing ideas with you, go ahead and ask for a contract. Editors who are seriously considering hiring you will be willing to negotiate with you. Define payment terms. Set up payment method and know when the publication will pay. Find out if you are responsible for submitting an invoice prior to publication or if the company's business office cuts a check without an official invoice. In some cases, writers may be able to ask for a percentage of the fee upfront. Again, this can be negotiated as part of a contract. Being pro-active can help writers avoid a writing catastrophe perpetrated through scams. Paying attention to an listing's language can save you time, and in the long run, money. Next time, I'll share ideas about legitimate job board listings - including WOW!s - and how a veteran freelance breaks down ads. Post by LuAnn Schindler. Read more of LuAnn's work at her website. The first one almost caught me recently. I had applied for a blogging gig and they asked for an article sample based on a topic they gave me. I definitely didn't trust it and I had remembered reading that they shouldn't be asking for a test article if you submitted writing samples (which I did). I'm glad I didn't follow through with it! A Writing Contest For Your Best Experience EVER!